What's NEW at NUGW ?! 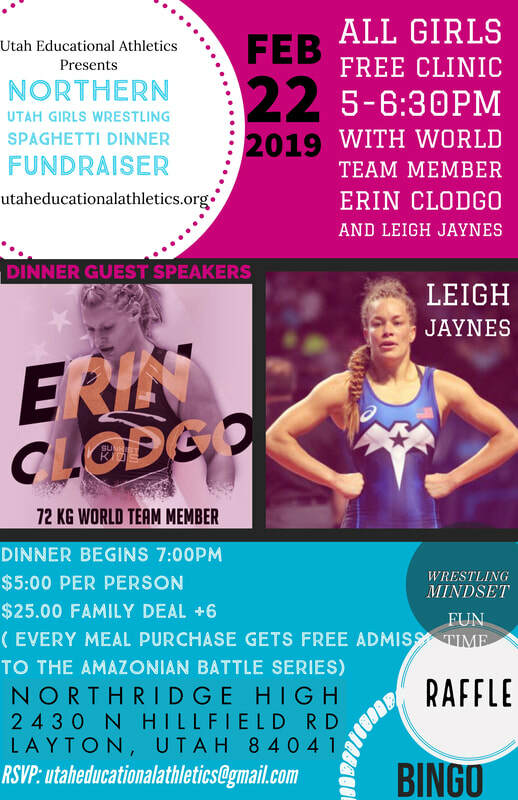 The Northern Utah Girls Wrestling club is hosting a free girls wrestling clinic this Friday, Feb. 22, at Northridge High in Layton, with accomplished American wrestlers Leigh Jaynes and Erin Clodgo. Jaynes won the bronze medal competing for Team USA at the 2015 World Wrestling Championships in women's freestyle. She also competed in the 2007 and 2012 World Wrestling Championships. Clodgo won gold at the 2016 Pan American Olympic qualifier, which helped Team USA qualify for the 2016 Summer Olympics in Brazil. Clodgo is also a three-time US Open champion (2010, 2015, 2017). The clinic is followed by a spaghetti dinner fundraiser for the club starting at 7 p.m. It costs $5 per person. It's the start of a packed weekend for the club, which includes its Queen Mothers Take Down Exhibition, which is another fundraiser where mothers sign up to wrestle each other. The event is meant to help parents gain appreciation for the time and energy their daughters commit to the sport. The club is also hosting a freestyle girls wrestling tournament at 8:30 a.m. Saturday, Feb. 23. Registration is $25. 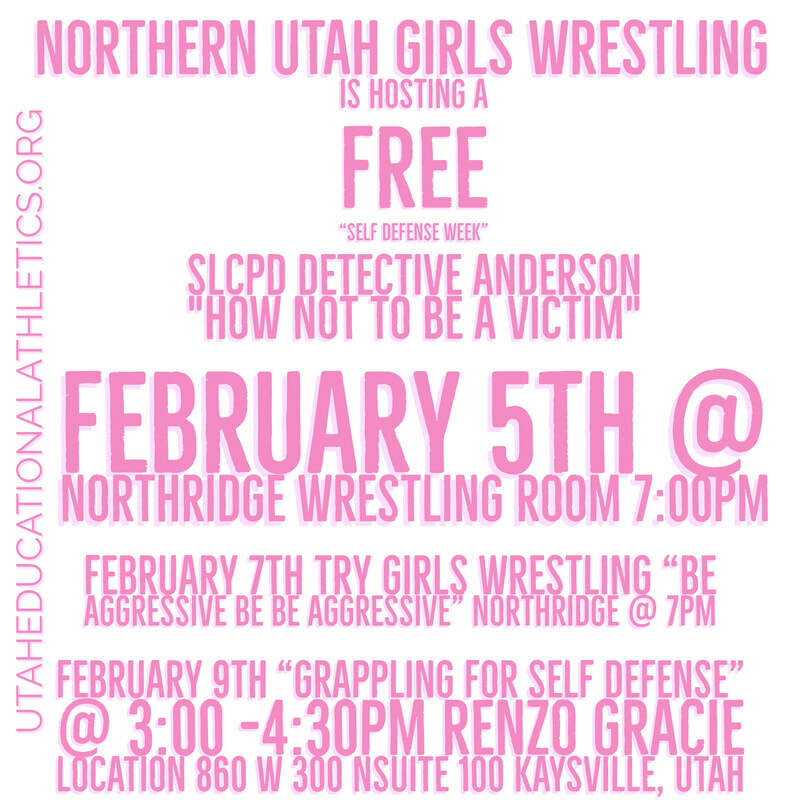 Those interested in more information about these events can email Maria Gomez at utaheducationalathletics@gmail.com. Imagine walking out onto the mat to face your opponent. You have prepared months and months for this match, and your heart is pounding out of your chest. You fix your ponytail and get into position. When you look up, you see an insanely muscular male walking towards you. You feel as if all of your preparation is about to go down the drain. Is this how you should feel about the sport you love? Girls wrestling is on its way to being treated as its own, to maintain fairness and equality for all competitors. In Davis School District, they are slowly but surely doing their best to make a change. Girls are competing in the Junior Highs, female coaches are being hired, and the high school team at Northridge High has nearly doubled in its amount of girls in the last year. 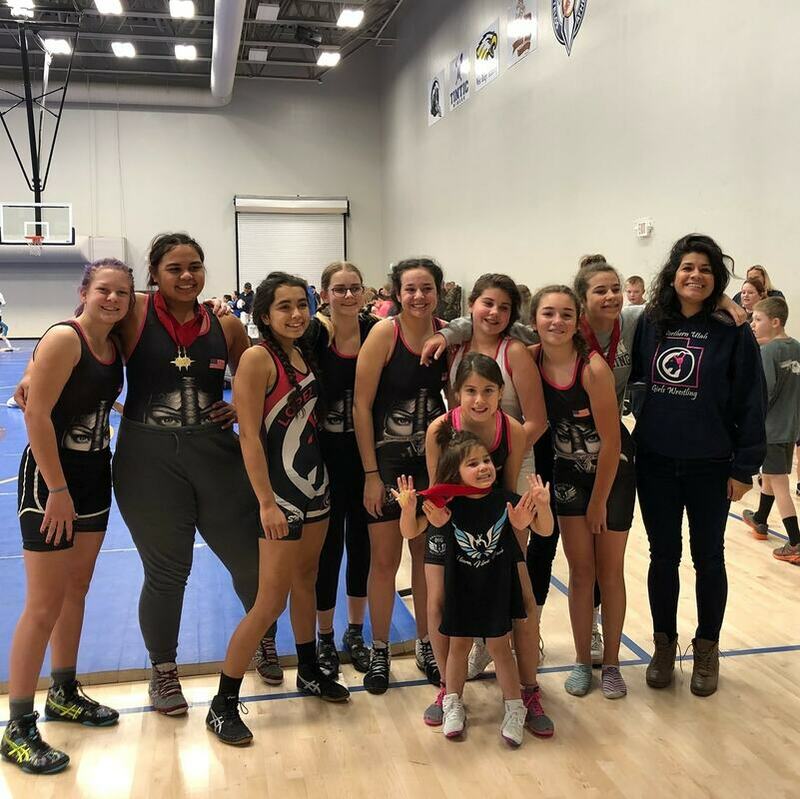 According to an article called, "Girls Wrestling Takes Off in Utah High Schools Despite Challenges” by Patrick Carr, he states that the national number of female wrestlers in the US was 7,351 in 2010-2011, and in 2016-2017, that number nearly doubled to a solid 14,587 girls participating in wrestling. 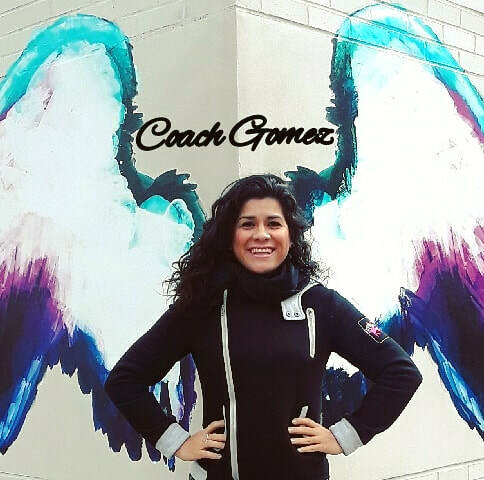 Maria Gomez is the first female educator to be hired in the state as a wrestling coach. 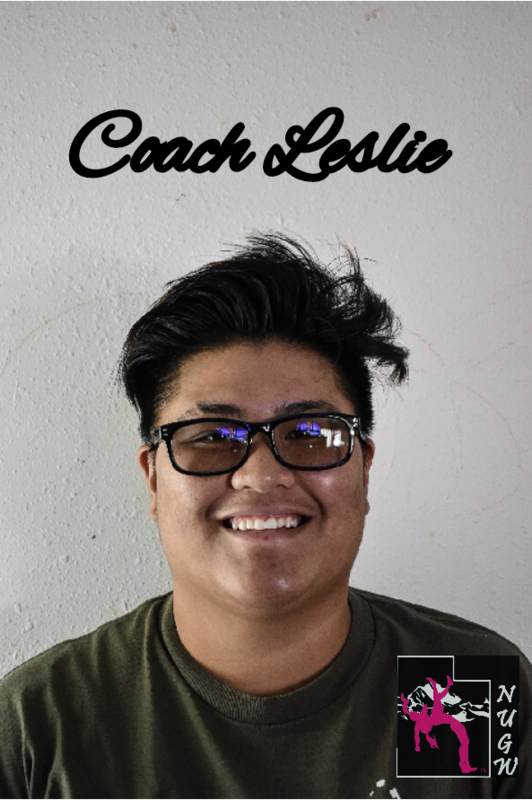 She’s the assistant coach at both Northridge High, and North Layton Junior High for this upcoming season and was the first woman to charter an all girls club in the state of Utah. 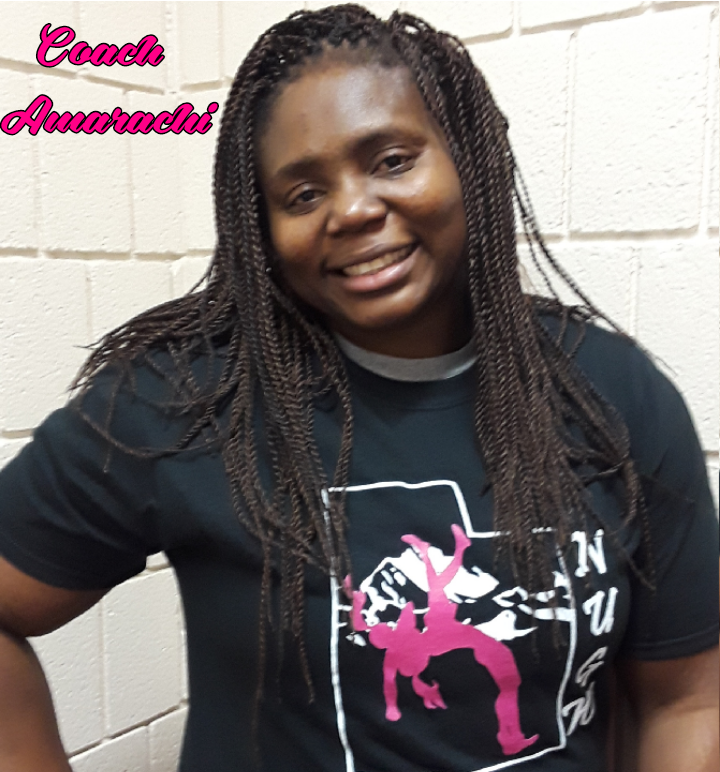 Maria was instrumental in creating and sustaining an audience for girls wrestling in Layton, Utah that has bloomed with the help of Rachel Meyer, NUGW Coaches Benita Karo, Cherri Webster, former Coach Courtney Maples (now assisting at UMA Girls), former Utah Girls Director Billy Cox, Olympian Nigerian Wrestler (now NUGW Head Freestyle Coach ) Coach Amarachi and Folkstyle Head Coach Lau. 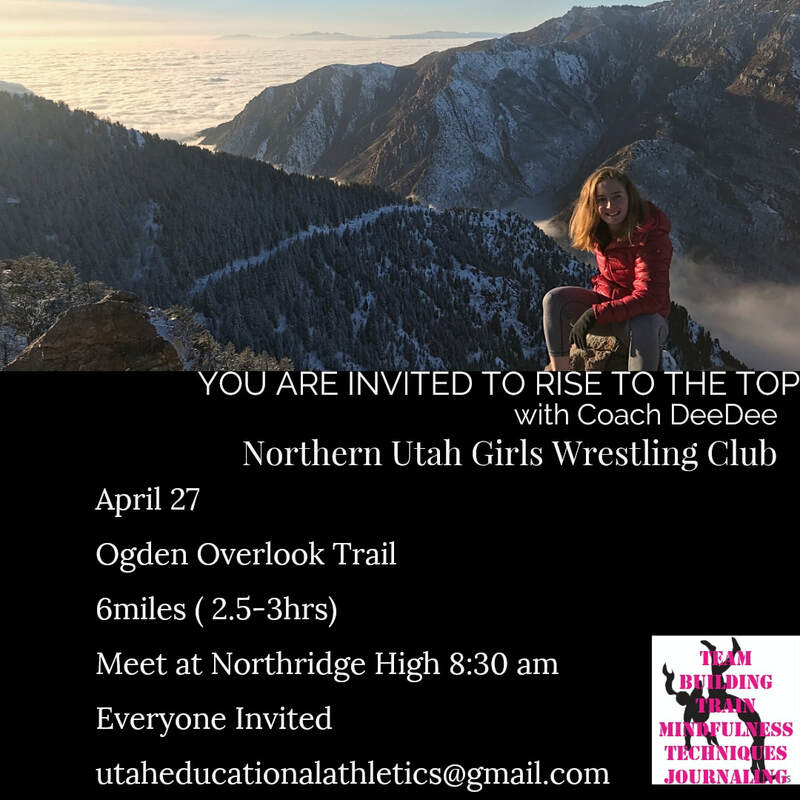 With the help of surrounding local Head Coaches, one that took it upon himself, Northridge High Head Coach Kevin Kennington that opened his wrestling doors to support and assist Maria in the journey that sustained the beginnings of Northern Utah Girls Wrestling. She has also created a competition platform called The Amazonian Battle Series. 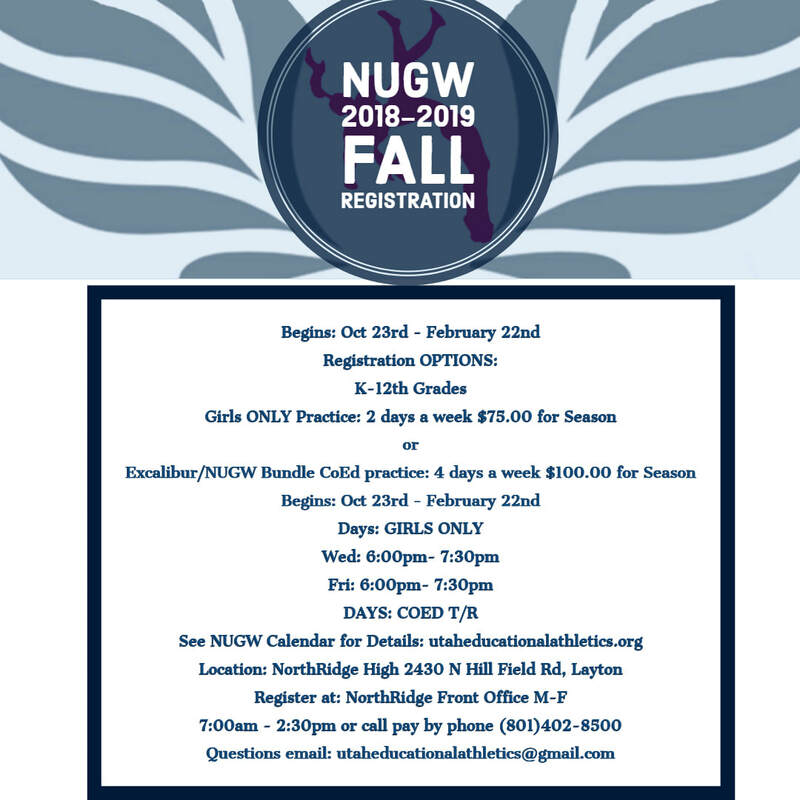 It's an all girls tournament that has grown from 1 to 3 tournaments in the last year with the help of Craig LaMont and Caleb Hardy hosting an All girls Battle this season. The ripple effect of leadership is evident and can build future generations stronger in the wrestling community another state accomplishment down south at American Leadership Academy Female All American Hailey Cox hired on as the Jr High Head Coach and Assistant at the high school wrestling programs. 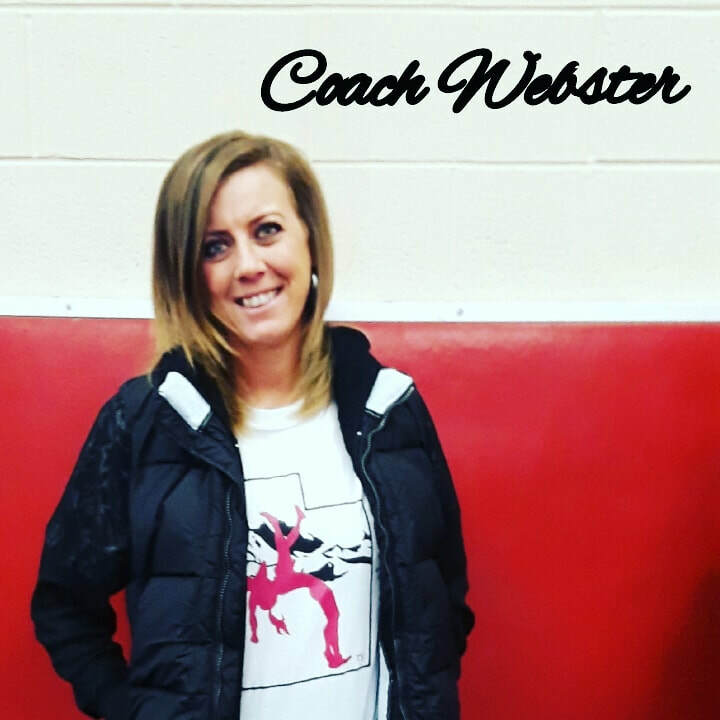 She has been a wrestler since she could walk, born and raised in a wrestling family, former resident at the Olympic Training Center, Cadet World Team member, another girls wrestling pioneer and has had many other firsts through her wrestling career and now will have many more as a female coach paving the way for Utah Girls Wrestling. 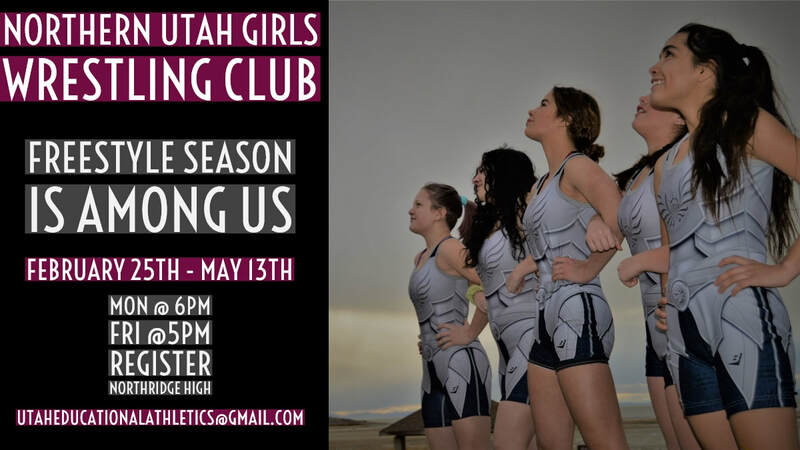 The Utah High School Athletic Association has seen and heard the voices of the state and has created a Female Equity/ Emerging Sports Committee, which is creating the process and application for future sports to be sanctioned. Maria Gomez serves in that committee with other superintendents, directors and principals that see the need to create opportunities and equality in the state for female athletes. 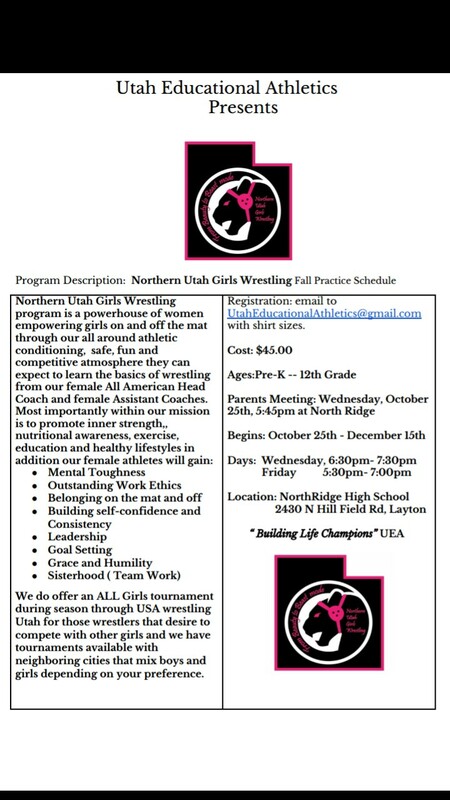 USA wrestling Utah has had a girls committee this year directed by Craig LaMont which serves and focuses on growing and creating opportunities for girl wrestlers in our state as well. As you can see, schools are on their way to gaining a bracket for young female wrestlers. Adding official brackets for girls only will allow females to wrestle their peers, and eliminate any fears that parents and competitors may have. With the help of the community around us, this change has impacted many lives, and many lives to come, but we all need to work together to ensure that there is a safe and ensuring environment for wrestling to occur. “We should not require young girls to test themselves against males in this sport in order to be a competitive wrestler, or be valued as a good wrestler. It is a tough and demanding sport as it is, and young girls deserve the right to compete with other tough female wrestlers.”-Katherine Fulp-Allen Shai. In the state of Utah there are countless of fathers for daughters, mothers for daughters, high school coaches , female coaches that are creating and paving the way to welcoming, safe, and empowering environments. 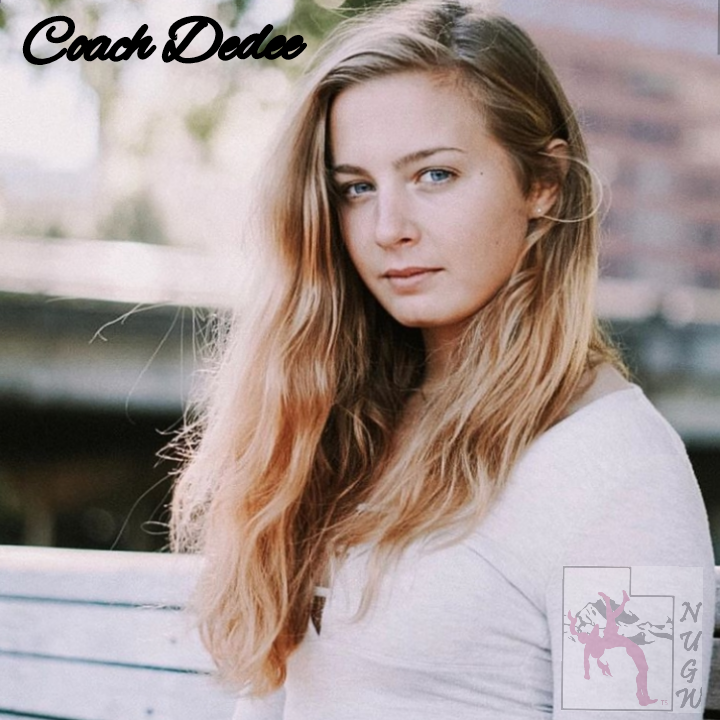 When female wrestlers are participating in practices, participating in tournaments, taking advantage of clinic opportunities you are thanking your Leaders for creating that space they made for you. We would like to thank the many that were not mentioned in this article, but know that you are appreciated by your community, your parents, your girls they know who you are, please continue the selfless work, because in the end you are changing a child's life one wrestling match at a time. The future looks bright when you train a girl to wrestle you train a generation to succeed. What makes a Girl Strong? Its her ability to not resign from life tribulations, hardships, struggle, she keeps on wrestling. NO ONE is born a great wrestler, it takes patience, time, practice.. practice and practice and even then true commitment because wrestling is not for the weak its for those that DON'T GIVE UP! This sport should always be FUN and when you feel you aren't having fun anymore, STOP, THINK and go BACK to the BASICS of when it was FUN for you and Start there. GREAT JOB LADY WRESTLERS! Looking forward for an AMAZING SEASON TO COME! Battle at SYRACUSE HIGH. Ladies you were Fierce, Fast and Fabulous!